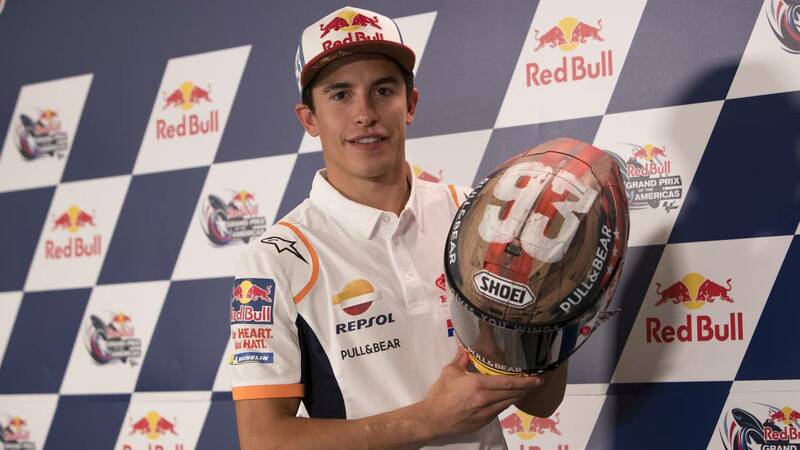 Home Moto Márquez: "Let's see here, because Argentina was a separate case"
Márquez: "Let's see here, because Argentina was a separate case"
The champion does not want confidence in a circuit in which he only wins since 2013 and despite the review he gave his rivals in Termas. Since his arrival on the World Cup calendar in 2013, , only Marc Márquez has been able to win in the Las Americas GP of MotoGP, and always starting from the pole position. With those numbers, it is not strange that in Texas you feel at home and open a new helmet for this event, rodeo style. -Is Austin the most complicated place to beat him? -Well, it's like when you go to a soccer game and you're extra confident because you come from the first leg with a good result and you find that you're taken out on the way back. That's why you do not have to go at all, zero, it's another circuit, another great prize, where we will try to give a hundred percent and where we will try to win. We know that it is one of the favorable circuits to try to win, but if in some case you can not we do not have to go crazy. I've already said, I've learned that I do not mind losing some battle but winning the war, which is at the end of the year. -The layout is very nice, but apparently it is very bumpy and that's a complication, is not it? ? -Of course, such a long layout, of so many curves, so many changes of direction and with such long braking is very difficult to square the perfect lap. It is difficult to be constant and it is very difficult not to make a mistake throughout the race, so that is where you have to work a little more and, apart, you have to add the bumps of this track, which are already characteristic. They say they have worked on it, they have done a good job and tomorrow we will see it and we will try to corroborate it. Hopefully it will be like that. -Did you like the way to win in Argentina to do the same here? -It's not the way Argentina of my style, but we are at the beginning of the season and hopefully I can do it here and also that I can do it in the next one. We'll see, because I think we're in a moment, in the first part of the season, in which anything goes, either points, either morally or at the level of confidence of the team or the driver. This gives you a little bit of the inertia of the whole season and it is important to start well. We'll see here because what of Argentina I think was a separate case. -Will there be new piece for the keel? The Ducati spoiler. - (Smiles). There is, there is something in the keel to cool the tire. (More smiles) . -Will it be released tomorrow? -Yes, yes. Well tomorrow is ready, is ready, I was already in Argentina but I did not give it much importance, but it is true that here it is ready, I think it is not to cool the tire, which is for something of the swingarm, but it does not happen nothing, only that it can not be said that it is for the aerodynamics so we will not say it. -It takes 25 points more than last year at this point. Could the World be finished before even last year? -This is like everything, I remember that there were people who last year saw me winning after Le Mans and I arrived in Mugello, I fell and we all got back together. Yes you can stay with the aftertaste of people, including me, with the aftertaste of the last race, which was one of the best of my sports career, but is a year ahead and surely Dovizioso will not make the mistakes of the year past. Valentino is again plugged in and we'll see it step by step. This is motorcycling, there is a factor that is called risk, another that is called mechanical and, if what happened to me on Saturday in Argentina happens to me on Sunday (the chain of his motorcycle went out), the story changes as there are many factors. We have to go race to race and get one hundred percent.